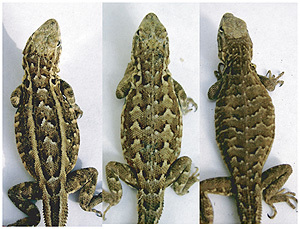 Back patterns seen in side-blotched lizards vary from stripes (left) to bars (right); chevrons (center) are an intermediate pattern. Photos by Lesley Lancaster. Mothers know best when it comes to dressing their children, at least among side-blotched lizards, a common species in the western United States. Researchers at the University of California, Santa Cruz, have found that female side-blotched lizards are able to induce different color patterns in their offspring in response to social cues, "dressing" their progeny in patterns they will wear for the rest of their lives. The mother's influence gives her progeny the patterns most likely to ensure success under the conditions they will encounter as adults. In a paper published June 10 in the online early edition of the journal Ecology Letters (and in a later print issue), the researchers reported that female side-blotched lizards give an extra dose of the hormone estradiol to their eggs in certain social circumstances. The extra hormone affects the back patterns of lizards that hatch from those eggs, creating either lengthwise stripes down their backs or bars stretching from side to side. Whether they get stripes or bars depends on the genes for other traits. "This is the first example in which exposure to the mother's hormones changes such a fundamental aspect of appearance. Even more exciting is that the mother has different patterns at her disposal, so she can ensure a good match between back patterns and other traits that her offspring possess," said Lesley Lancaster, a UCSC graduate student and first author of the paper. Coauthor Barry Sinervo, professor of ecology and evolutionary biology, is Lancaster's adviser and has been studying side-blotched lizards for nearly 20 years. He said the lizards' main predator, the coachwhip snake, is a highly efficient hunter, and the lizards need just the right combination of traits to avoid being eaten. "The females are dressing their progeny for success, because they need a different back pattern in different conditions," Sinervo said. "It's like fashion--she wants to make the rare, fashionable progeny that won't be caught by predators." Lancaster used a combination of laboratory and field experiments to tease apart a complex set of interactions involving hormones, genetics, social interactions, behavioral strategies, and predators. Previous studies by Sinervo and his collaborators have described three different behavioral strategies that correlate with throat color in side-blotched lizards. Orange-throated males are highly aggressive and usurp territory from other lizards; yellow-throated males sneak into the territories of other males to mate with females; and blue-throated males form partnerships and cooperate to protect their territories. In females, throat color correlates with different reproductive strategies. According to Lancaster, the maternal effect on back pattern is important because survival in these lizards depends on different combinations of traits in different circumstances. Females use social cues to predict the circumstances their progeny will encounter. Maternal influences like this probably occur in many species, but are very difficult to detect, Sinervo said. "Maternal effects are a nebulous thing to study, because you know there are genes for these traits, and it's really hard to tell the maternal effects apart from the effects of the genes," he said. Lancaster began by treating side-blotched lizard eggs with an array of different hormones. That revealed a striking influence of estradiol on back patterns. She also tested eggs from lizards captured in the wild and found a wide range of naturally occurring estradiol concentrations in the egg yolks. The researchers then performed experiments in breeding enclosures, each holding one male lizard and three females. The numbers of orange- and yellow-throated females in each enclosure were experimentally varied, and throat colors of the males varied randomly. Lancaster tested eggs from each female's clutch for hormone levels and recorded the color patterns of the progeny before releasing them into the wild to see how well they survived. To avoid predators, the lizards need a back pattern that matches their behavior. Sneaky yellow-throated males like to hide in the grass and need a barred pattern that breaks up the outline of their body so it blends in with the background. Aggressive orange males spend a lot of time in the open and need stripes to help them escape from predators (the optical effect of stripes on fast-moving prey makes them hard to catch). But the genes that control behavior and back pattern are not linked, so a lizard could end up with a mismatch that would leave it highly vulnerable to predators--wearing stripes and trying to hide in the grass, for example. Lancaster identified two pathways by which an extra dose of estradiol from the mother can help to resolve this problem. In one pathway, females increased the amount of estradiol to their eggs when their mate had a yellow throat. The hormone induced a barred back pattern in yellow-throated offspring. The barred pattern was not induced in non-yellow progeny. In the other pathway, the extra hormone was prompted by an abundance of orange-throated lizards in the female's social environment. In orange-throated sons, the hormone induced a striped back pattern (suitable for an aggressive male spending lots of time in the open). Stripes were also induced in non-orange daughters. Both of these effects were inhibited by yellow genes. "This is a classic example of an interaction between genes and environmental influences on traits," Lancaster said. "Females provide an estradiol-rich prenatal environment to their entire clutch, but different progeny respond to it in different ways depending on which genes they inherit for throat color. So a female could make some progeny barred and others from the same clutch striped, depending on what's best for each individual." It is not yet clear why an "orange" social environment triggers this hormonal tweaking of the eggs. "The females are responding to cues that predict something about the future environment, but we're not sure yet exactly what that is," Lancaster said. "Orange-throated neighbors may indicate a trend in the frequency of orange-throated lizards within the population or in the overall population density." According to Sinervo, the density of the lizard population is probably a critical factor. At high densities, the aggressive orange-throated males are so busy fighting with other lizards that they are especially vulnerable to predators. As a result, the predators are likely to focus on them, giving a survival advantage to lizards with different patterns. After Lancaster released the lizards from her breeding experiments into the wild, she found that the ones whose mothers had tweaked their back patterns had a clear survival advantage. The highest survival rates were seen in the induced progeny types--yellow-throated lizards of both sexes with barred backs, orange-throated males with striped backs, and blue-throated females with striped backs. "The frequencies of yellow and orange were both increasing in the wild that year, so the females exposed to orange neighbors and yellow sires in the experiments had the most fit progeny," Lancaster said. "But under different environments, maybe the progeny that weren't tweaked would have the highest fitness. If these same estradiol-induced types had the highest survival rates in all years, there would be no need for the females to respond to their social environment--they would just always give their eggs estradiol." To understand these complex interactions more fully, the researchers plan to study the hormones and their effects in the field over several generations of lizards. In addition to Lancaster and Sinervo, the other coauthors of the paper are UCSC postdoctoral researcher Andrew McAdam and John Wingfield of the University of Washington. This research was supported by the National Science Foundation, Sigma Xi, and the American Society of Ichthyologists and Herpetologists. Note to reporters: You may contact Lancaster at lesley@biology.ucsc.edu and Sinervo at (831) 459-3425 or sinervo@biology.ucsc.edu.